Industry studies have shown that conspicuity tape can enhance nighttime safety by allowing easier detection of trucks and trailers. We offer a full line of products exceeding DOT-C2 requirements. Aura Optical Systems offers two different grades of conspicuity tape as part of the Aura 135 Conspicuity Tape product line. Single-layer, metalized construction to prevent edge-lifting. Microprismatic reflective optics for enhanced nighttime visibility. Aggresive adhesive for bonding to difficult subtrates. Meets the requirements of FMVSS-108 and contains DOT-C2 marking. Can be customized with a corporate logo or graphic. AURA 135-HY (Hybrid Polymer). Incorporates our proprietary Hybrid Polymer technology for a stronger and more impact resistant conspicuity tape. Durability of 7 years. AURA 135-AM (Aftermarket Grade). 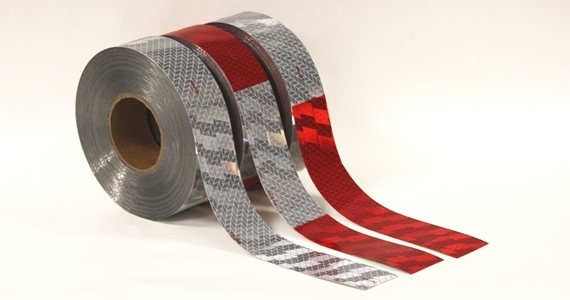 Most cost-effective solution to replace a few strips of conspicuity tape on existing traliers or vehicles. Durability of 3 years.